Fire Safety Store is delighted to be able offer an added sense of style to go along with comprehensive fire safety. 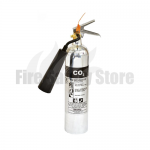 Ideal for designer stores and such premises, our stunning collection of stainless steel fire extinguishers embody all of the properties that make the perfect fire extinguisher along with a smooth, chrome like, polished finish. These extinguishers have proven highly popular in places such as car showrooms, clothes shops, hotels, salons and health centres as their classy look blends in to aesthetically appealing workplaces seamlessly. They are also useful for outdoor and water areas as their stainless steel finish makes them less liable to corrosion. 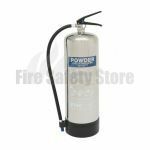 We supply two types of stainless steel fire extinguishers – water and foam and all models have a 15 bar working pressure to ensure the very best in performance. 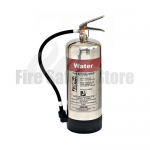 Our water stainless steel fire extinguishers are available in a 6 litre and 9 litre size. Just like other water canisters they should only be used on Class A fires involving solid, combustible components such as cloth, textiles and paper. 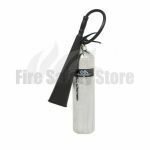 Water stainless steel fire extinguishers still have to have some form of easy identification should they ever need to be used. Legislations dictates that like its red bodied counterpart, the water chrome extinguisher should be complete with a red label. 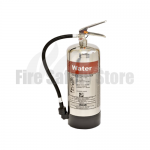 Water extinguishers are known for their qualities of fighting fires involving everyday fires and the stainless steel version retains these vital elements. Of course, water stainless steel fire extinguishers should never be used to tackle electrical, Class B, Class C or Class F fires as they will do more harm than good. Just like our water versions, Fire Safety Store’s catalogue of foam stainless steel fire extinguishers come in 6 and 9 litre varieties. Foam extinguishers are for use on Class A (combustible solids) fires and Class B (flammable liquids such as petrol, diesel and spirits) blazes. 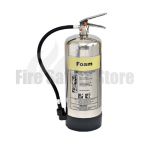 Foam stainless steel extinguishers come complete with a cream label so they can still be easily recognised in the event that they are called into action. It should be noted that foam extinguishers should never be called upon in an attempt to deal with fires involving gases and cooking fats and oils. They must be used with caution on electrical fires but as a rule of thumb should be avoided. If there is no other option and power supplies are not connected, they can potentially be used but will end up causing unfixable damage. Fire experts highly recommend that they not be used on electrical items. 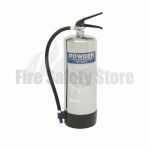 To complement our beautiful range of stainless steel fire extinguishers, we also offer both single and double chrome stands to give extinguishers a storage place as elegant and practical as they themselves are. All orders placed before 2pm are eligible for next working day delivery. To find out more about these fashionable products, any other of products or to enquire about something not on site, call us today Freephone on: 0800 316 0890. A member of our team will be glad to assist you.